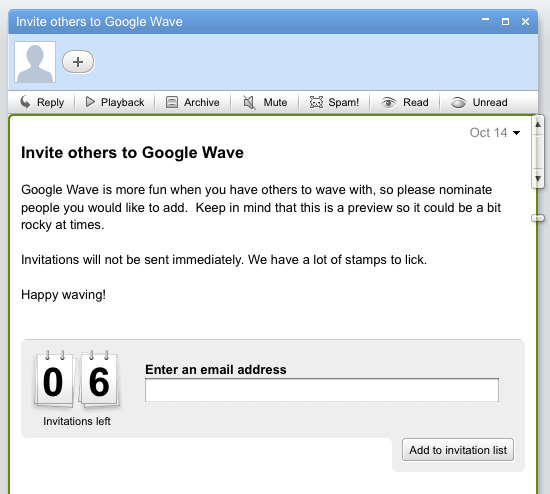 Google Wave Invitations – Come And Get’em, They’re Free! Google Wave is a rather new and fancy product from Google that’s still in preview and so it’s not possible to join it instantly. You can, however, get invited and hopefully get access faster than if you apply directly. Google Wave is a shared workspace where you can discuss stuff, work, communicate with friends, co-workers etc., using text, photos and a bunch of other media. Okay, so I assume you’re here for the invites. 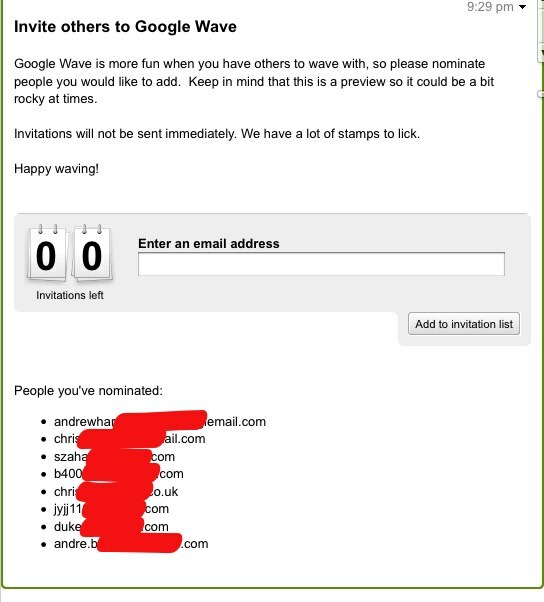 I was granted access to Google Wave yesterday and so I have some invitations available. I have 6 left, as you can see on the screenshot, and I’m going to give them away to my TechPatio readers. ReTweet this post – please use the retweet button in the lower right corner just below this post. Digg this post, using the button in the same area as the retweet button. Write a comment below confirming that you have retweet and dugg this post. I will then, as soon as I see your comment, send the invitation to the e-mail address you used for your comment. So I don’t know exactly when you will receive the invitation. But hey, I guess it should be faster than applying for access directly at the Wave website. Sorry – no more invitations left! Comments are closed! Okay, this took me completely by surprise. In less than a minute after I published this post, I had 5 visitors from FriendFeed in here. In just 25 minutes I had received over 20 comments, 4 diggs (guess somebody didn’t digg it after all?) and 9 tweets using the tweet button. Maybe I should have asked for digg and twitter username to verify the details 🙂 But I picked those that were first and seemed to have both dugg and tweeted as asked for, and added you guys to the invitation list. Below you’ll find a screenshot of the users that made it. Of course I removed some of parts of the e-mail addresses but hopefully you will be able to make out if you were included it or not. I removed all e-mail addresses from the comments as well, so spam bots doesn’t index them and start sending you spam. Sorry to those of you who didn’t get an invitation. I hope that those of you who did, will receive it as soon as possible – we just need Google to lick the stamps a bit faster! I’m not seeing your digg….? Feel free to try again. Looks like it – so you’ve been added to the list as well. Thanks – I have verified your tweet, so I added you to the invitation list. Contact me for proof later if necessary. I would like an invitation to the Google Wave. I would like to use it to communicate with our developer team. You’ve also been added to the invitation list. Hey, retweeted and dugg it :). I’d really appreciate if you invite me, i really wanna wavee :D.
Done! Hoping to receive an invite. Thanks in advance. Previous post: Firefox 3.6 Will Support Accelerometers – Beta Release Tomorrow?